Sunrise animation studio will be coming out with a series of animation art books in 2012. They are scheduled to be published in different months. The book for Cowboy Bebop is among the first to come out. This is a 198-page paperback. It collects the concept art for the whole TV series. Everything is in line art. There are character design, interior design, props, background art, the vehicles and spacecrafts. No storyboards except for the opening and ending film credits. Every piece of art are labeled with the episode they appeared in. I'll have to watch Cowboy Bebop (1998) again as I really can't remember many characters, except for the 4 key characters plus the cute dog. I still remember the opening tune in my mind, strangely. There are a lot of drawings to see. There are so many things that are used in the animation. They even have designs for small items like casino chips. Character designs have front and back profiles, in different expressions, and in various costumes as they appeared in different episodes. The environment concepts are very interesting also, towns from outer space, the imagined futuristic (2071) buildings and deco back when the animation was produced. 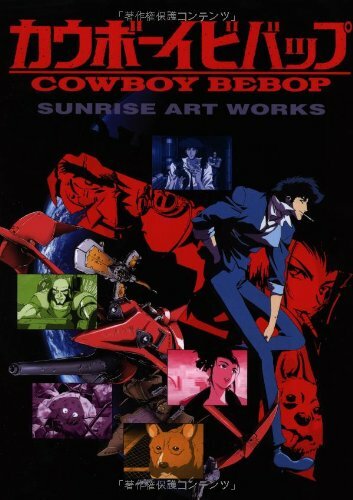 It's a good book for Japanese animation, concept art and Cowboy Bebop fans. For coloured illustrations, you can check out Cowboy Bebop Illustrations ~ The Wind ~ if you can find the book. Below's the list of the Sunrise animation books coming out. Japanese titles are linked to Amazon Japan while English titles are linked to Wikipedia. Cowboy Bebop is probably the only book I'm getting since I've not seen the other animation, many of which I've not even heard of. Oh WOW this look fkin awesome. Thanks for the review.